How much do the weekends cost? The price varies between each individual site depending on the place where the retreat is held. Most of the weekends are offered for an average of $130.00 for the entire weekend. This price includes your room, all your meals, and all retreat materials. Most all the Rachel's Vineyard sites have financial assistance or they can work out a monthly payment plan so that money is not an obstacle for your participation. Some sites are able to offer those in financial need a complete scholarship. You need to e-mail or phone the Rachel's Vineyard contact at the site you wish to register to find out specific details regarding the weekend you would like to attend. To view a listing of weekends click here. You can also call our toll-free hotline at 877 HOPE 4 ME. Most of the Rachel's Vineyard weekends begin on Friday evening and run until Sunday late afternoon early evening. You are invited to come and spend the entire weekend, have all your meals with us, and in most places, you will have a private room for sleeping, although some places may have a shared room. You can ask specific questions regarding each site from the local retreat coordinator. Each weekend is composed of a group of people who have been trained in the Rachel's Vineyard process. They include a team consisting of a professional counselor, women and men who have also experienced abortion, loving and non-judgmental lay volunteers, and a representative of God -- a minister or priest. These individuals volunteer their time freely, because they understand the importance of healing and recovery surrounding the pain of abortion. They are competent and caring individuals who will respect where you are in the grief process and help you move into a deeper level of healing. Each exercise in an invitation to explore your feelings and emotions. Nothing will be forced on you at any time. The process is respective of different faith traditions and cultural heritage. You are invited to share with the group, but you can also process this experience privately within the silence of your own heart. There will be no effort to proselytize or convert you to Christianity, but simply an invitation to dialogue with your creator through a very personal and intimate process. Rachel's Vineyard weekend retreats typically have around 12-15 participants on each weekend. At some sites the size may be smaller or larger, depending on the facility. The group maintains a small and intimate size to allow each participant time for sharing and processing the exercises together. There is also a team of approximately 6 helpers and retreat team members who help facilitate the actual weekend, conduct the exercises, serve delicious meals and attend to any special needs you may have. Why do this in a group? We see abortion as a trauma. Traumatic events are often aggravated by the need to keep it a carefully guarded secret whereby the toxic and shameful feelings have no voice. Healing for victims of trauma can be accomplished by establishing safety, reconstructing the trauma story, and restoring the connection between survivors and the community. A group context is very cathartic because others who "have been there" can provide validation of symptoms and a supportive, healing element to the process. This does not negate the value of individual counseling and support, however, an experience of group process, particularly when family support can be introduced, often provides a deeper more complete level of healing. You may read about the experiences of others who have labored in Rachel's Vineyard. Can men go on a Rachel's Vineyard retreat? Should I consider inviting my spouse or support person to go with me on the weekend? We have seen many married couples attend the weekend together. Some whose spouses participated in the abortion, and others who were not involved with a previous abortion, but who come as a support person. The results have been exceptionally positive and all report an increase in communication and intimacy after the weekend. There have also been individuals who decide to come with one or both of their parents, specifically if the parent forced their daughter to have an abortion or if the decision was made based on fears or disapproval. Naturally, the damage to family relationships can be opened for healing in Rachel's Vineyard The weekend is a unique opportunity to address this pain and reconcile the experience with each other. So we gently encourage you to consider this option, but will always respect your unique circumstances if you decide this is not what is best for you. There will always be opportunities in the future to take this step if you are searching for additional healing and reconciliation. During the Rachel's Vineyard weekend, we encounter healing through seeking re-connection, integration, and wholeness. Such healing can only happen when the isolation and secrecy are dismantled, and one's story is revealed to others who do not seek to judge and condemn. Only then is it finally possible, with the support of a small community of others who compassionately affirm the loss and respect the grief, to grieve one's losses to their fullness. The importance of social support to the grief process reflects an important aspect of our human nature: Though we are individuals, we are inescapably social beings. The lack of social support will degrade or destroy our well-being. Conversely, the experience of social support, in even a single relationship, can strengthen our well-being. For most of us, it is only when we have the support of others who will not judge or condemn us that we feel safe from social rejection. This support makes it easier for us to confront and explore the deepest part of our souls. With it, one learns how to accept forgiveness from God and one's aborted child. With it, one learns how to extend forgiveness to oneself and others. And with it, one discovers how the most difficult soul-breaking experiences imaginable can be used as the foundation for building a richer, deeper, and more meaningful existence. Safety and confidentiality are essential when one begins to explore post abortion healing. However if the healing process encourages only private counsel, not involving spouses, or family in the process, this may actually reinforce the isolation that one experienced when they initially went away in secret to "deal with the problem." So counseling itself can be surrounded with the same anxiety as going away in secret to have an abortion, because you are still going away alone to deal with the aftermath. Consequently, the secret is still intact and so is the shame and guilt surrounding it. As long as one has the lingering doubt that if my parents, my spouse, my sister, etc., know about my abortion they would reject me, judge me, condemn me, or hurt me, one is not free to trust or experience the blessed intimacy of being known, unconditionally accepted, and loved. Frequently, we can only feel loved to the extent that others know us and accept us. Perhaps someone close to you might need to learn more about abortion trauma and some of the ways that this experience can impact a woman. 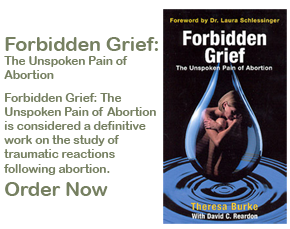 Forbidden Grief is a good resource for education on this subject. What are the benefits to inviting a support person? As your are working to reconnect to past memories and feelings, you can also reach out to the terminated or damaged relationships in your family. The memorial service is a beautiful vehicle to help facilitate this reconciliation. If you choose to share this event with a family member, spouse, or someone who cares deeply about you, your guest will be affirmed for their support. Our staff is present to model and instruct how they can best be supportive. The experience of grief is bonding. Sharing grief naturally leads to intimacy, as you will surely experience on a Rachel's Vineyard weekend. I witnessed miracles last weekend. Our daughter invited us for the memorial service on her Rachel's Vineyard weekend. It was a profound experience: women and men given the opportunity to grieve openly, to name that grief and those children, and to share the joy that comes with the realization that your are not alone in your grief. I feel so much closer to my daughter now - and feel honored that she trusted us enough to be present to her in this pain. Weekends, such as the one are were privileged to witness, give us back the essential part of healing. Thank you all. At this time it was also a miracle to see the church function as it should as a loving sheltering structure enhancing relationships with God, rather that and institution often hindering them. Peace. The Rachel's Vineyard weekend is very respectful of the unique needs and situations of all participants. For most people it is only after they are well into the weekend that they feel the desire to invite a loved one to the memorial service. The comfort of a close family member can be an important event in the healing of isolation and feelings of abandonment which frequently accompany an abortion experience. Sharing grief, and the healing and hope that follows, can bond us in a deeper way with those we love. Can this weekend program help my marriage? The weekend will be especially helpful to couples who have not been able to grieve together. The inability for husbands and wives to acknowledge this loss and creates distance bitterness and resentment. When men join in the healing journey with their wives it opens the door to a dramatic increase in physical and emotional intimacy. Yes. When you sign up for a retreat, your name will not be given to any other individual or group for any circumstance. If you choose to be listed on a contact list for the other members of your weekend group, that is your decision. You can inquire about this program by e-mail or telephone and you can specify how you would like to receive any information. You might also choose to attend a Rachel's Vineyard weekend that is in a different location from where you live to assure complete anonymity. If you have any questions for us, please see our confidential e-mail page and talk to one of our Rachel's Vineyard e-mail buddies. What happens after the Rachel's Vineyard weekend? After your weekend you will have met some wonderful people who may become your very best friends. Most sites offer a reunion for those who wish to participate and nearly all the Rachel's Vineyard sites offer ongoing opportunities to address other concerns you may want to explore following the weekend. For example, if you have a history of sexual abuse, may decide that they want to begin working on those issues; or if you struggle with alcoholism or an eating disorder, there will be referrals given at the weekend to help you continue in your healing journey. There will be other events and meetings for those who want to stay connected to Rachel's Vineyard. We invite all our past alumni to subscribe to a monthly e-letter that you can receive for the first year after your retreat called Oaktrees. It is written for and by those who have been on the weekend and is a wonderful resource for aftercare. More information is available about Oaktrees. Some women and men might feel called to get involved in other ways by helping on a future retreat team or other involvement with Rachel's Vineyard on a local or national level.